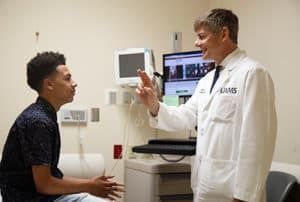 Sept. 21, 2018 | Early on May 27, UAMS neuroradiologist Martin Radvany, M.D., was working to make sure that a joke about stroke from teenager Dra Bishop was not the last joke Dra made. Bishop’s stroke was not a laughing matter. 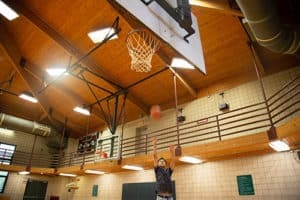 Dra, 16, a Bentonville High School and Amateur Athletic Union (AAU) basketball player, was feeling a little sluggish when he got out of bed on the morning of May 26. Typically, Dra was enthusiastic and hard charging on a game day like that Saturday. His mother, Angela Copeland, noticed his lack of energy, but wrote it off as teenage lethargy. Radvany tests Dra’s ability to follow movement with his eyes during a recent visit to UAMS. 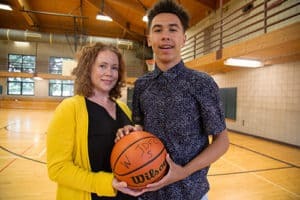 Later in the day, she and Dra traveled from their northwest Arkansas home to Tulsa, Oklahoma, where her son played two AAU games. Dra explained after the game that his misses probably happened because his right hand felt weird and heavy. He and his mother thought that may have been caused by muscle strain and fatigue from some pre-game weight training. Back at home and on waking at 6 p.m. from an afternoon nap, Dra called his mother on his cell phone, knowing she was only a room or two away in the house. She didn’t answer the call but yelled at him to get out of bed. “He came in the room and said, ‘Hey, Mom, I think I’ve had a stroke.’ He looked just fine, and we started joking about it. About two hours later, we were watching the Cavs-Celtics game and all of the sudden, I was joking with him, and he wasn’t responding,” Copeland said. Initially, they thought his partial paralysis might be due to muscle loss and dehydration, but the hospital staff recommended Dra be transferred to Arkansas Children’s Hospital (ACH) in Little Rock for a full diagnosis by a neurologist. An MRI scan done there confirmed Dra was having a stroke, and Radvany was called in to the hospital. By 1 a.m., Radvany and the stroke care team were working to remove the clot. Radvany, a professor and chief of interventional neuroradiology in the UAMS College of Medicine Department of Radiology, also sees ACH pediatric patients. Adults typically develop high blood pressure, arteriosclerosis and other health conditions that can contribute to stroke, but children usually don’t have those issues, Radvany said. Radvany inserted a catheter through an artery in Dra’s leg and with the visual guidance of a live, real-time x-ray used it to get to the clot. The team deployed a small stent to trap the clot in Dra’s brain, and then introduced a suction catheter very close to the clot to gently pull it out. Bishops shoots for the goal after a visit to UAMS. After the procedure, Dra was moved to a patient bed in the hospital’s intensive care unit to recover. He spent the next three weeks undergoing physical therapy before he was discharged to return home. Dra continued to take part in physical therapy over the summer along with follow-up visits with Radvany. Both Dra and his mother are grateful to Radvany and the team for saving Dra’s life. Copeland said Dra sometimes still experiences a slight aphasia, a loss of the ability to understand or express speech, and Dra acknowledges that and some remaining small-motion problems in his right hand. Both mother and son are optimistic about his chances of overcoming these remaining effects of the stroke and returning to the basketball court in the coming months. Likewise, Radvany said Dra’s youth will be advantage in his recovery because his brain still is dynamically growing and developing, allowing it effectively to route around any neural damage and function normally.